I have noticed an increasing trend during the second half of 2015, which I believe will further increase in 2016: the recognized importance of links within online marketing by those outside SEO. Specifically, this recognition is happening by those higher up the marketing food chain: CMOs, VPs and marketing managers. I’m in a unique position to recognize this trend, working within the marketing department for an SEO agency specializing in link building & acquisition. We do both inbound and outbound marketing, and I am able to monitor both our leads and new clients to see their company, niche, and role within their organization. I have unique access to see those who are interested in the direct pursuit of links, and I have ongoing discussions with our sales and production department to better understand our leads, clients, and their expectations. Links are gaining focus in the marketing world. SEOs won’t be the only ones tracking links. Search as a channel is impossible to ignore in the online marketing spectrum, and links are a good signal for SEO improvement. Search optimization is complicated and often technical, but links are easy to understand. SEOs, case studies, research, and Google still point to the power of links. Competitive SERPs require links. Links directly translate to audience exposure, branding, and visibility. Links can empower most other online marketing activities. Links are increasingly hard to fake. Only real links will move the needle, and real links don’t happen without dedicated, strategic effort. Links have been important in online marketing since the birth of the web. This consistent value, combined with the increasing importance of online marketing in the traditional marketing budget, is leading large organizations to recognize links as a key performance indicator (KPI) within online marketing. 1) Search as a channel is impossible to ignore in the online marketing spectrum and links are a good signal for SEO improvement. Search as a channel dominates the online marketing world. For broad reach, exposure, and audience development, search presence is a must. Ranking highly in organic search for terms relevant to your business is critical to online growth. People trust Google’s results as a whole, and if you’re not visible in search you’re missing out on extremely valuable marketing opportunities. Back in 2013, when Google’s services went dark for roughly a minute, 40% of all internet traffic disappeared according to GoSquared. A study in 2014 by Groupon demonstrated that up to 60% of direct traffic was actually misattributed organic. This led Conductor to attribute 64% of all traffic to organic in a study of 310m visits to websites. Search is a channel that cannot be ignored in online marketing. And links are critical to success within search. But links aren’t the first step in search engine optimization – they’re arguably the last. Links (inbound links, as opposed to internal links), are the SEO factor least in your control. On-page, technical SEO is difficult, but resides within your own ability to directly manipulate and control. That’s not to downplay the importance of technical SEO. Technical SEO is hugely important, and often never ends (depending upon the site). Technical SEO — despite emerging technology — isn’t going away. But whereas technical and on-page SEO are the foundations you create, links are the competitive barrier. The signal of authority, relevance, and trust controlled and granted by others. The only way to secure real links is to convince other people with valuable websites to link to you. You don’t have control over the way they link, when they link, or even if they link. You can only influence – not control. This makes links a better KPI for marketers to understand. Links are based on market influence, not technical elements coded into a page or server. 2) SEOs, research, case studies and Google continue to stand behind the value of links. Google became the prominent search engine because they provided better results. They provided better results because their algorithm took into account a factor no other search engine used at the time: links. Today Google’s quick to tout over 200 ranking signals used within the search algorithm. However, they also continue to invest heavily in links as a signal. The fact of the matter is that SEOs, research, case studies and even Google continue to place strong weight on links as a signal. This constant reaffirmation of the value of links within search make it easy for more traditional marketers to equate links with search visibility – not incorrectly. Every time Google updates the Penguin algorithm they invest further into cleaning up links as a signal. Every iteration of Penguin makes links a little more trustworthy, removes more spam, and actually helps improve the use of links within search rankings. Moz’s annual survey of SEOs regarding search ranking factors once again shows a strong belief that links play a significant role in search rankings. More research, again from Moz, shows that you can’t expect to rank in competitive SERPs without links. Numerous case studies from Brian Dean of Backlinko back up these findings. 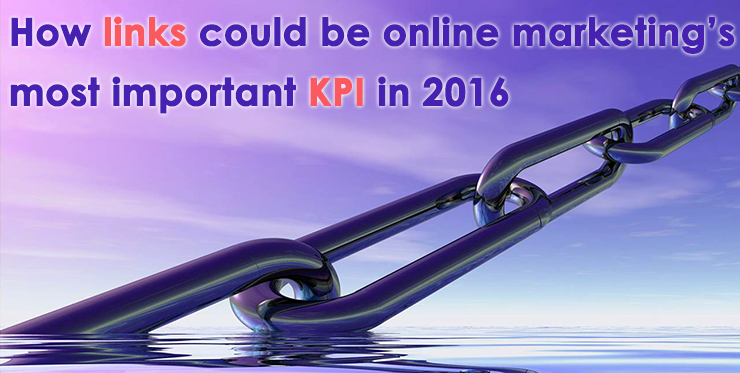 Links lead to search visibility improvement, and thus are a KPI worth considering in online marketing. 3) Links directly translate to audience exposure, branding, and visibility. The PR industry exists to help bolster mentions, press, and coverage of your brand, products, and company. You know what’s better than a mention? A link. And coverage is missing an important piece of the equation if you’re not getting a link in conjunction. There’s no doubt about the value of PR within the marketing world. I bring up the idea of introducing links, commonly an SEO consideration, into the world of PR to highlight a point. Yes, you could tell your PR staff to make sure links are included in coverage. You could avoid SEOs altogether, although I wouldn’t recommend it. The very fact that anyone would consider asking PR staff to consider links highlights their growth as an important KPI in online marketing. In all online marketing – not just SEO. The fact is links fuel online navigation, in nearly every way. The value of links online is a topic I’ve covered here on Search Engine Watch before. Suffice to say that the internet would need to fundamentally change to reduce the value of links online, even outside of search considerations. Currently the entire experience of the web is fuelled by links, shuffling humans from site to site, page to page. 4) Links can empower most other online marketing activities. Marketing is fuelled by visibility. The more attention you can gain to your marketing activities, the better that marketing typically performs. Links exist precisely to aid online navigation. The more links you can point back to your marketing — be it content, PR, email marketing, social media, or community engagement — the more visible these activities will be. Particularly if you’re building real links of value. Links that exist to make the internet better, help humans, and are naturally placed on the web. Links hit multiple checkboxes: building relationships with other people in your industry (who just so happen to have a worthwhile platform), potential referral traffic, and SEO improvement. When explaining link building to those new to the process, I often refer to it as direct promotion. The goal should be to go out and promote your asset to someone with a worthwhile platform and similar audience, with the primary goal of a link. If you secure that link you’ve established a decent relationship, you’ve tapped into their audience, and you earned yourself search visibility. All of these benefits can provide a lift in marketing performance, because they’re all designed to help draw more eyes and attention – specifically qualified attention – to your marketing. If you’re creating content, hosting events, or engaging in online marketing you should be considering links – which makes links a qualified KPI. 5) Real links are increasingly hard to fake. Those four factors are incredibly hard to fake. More so now than ever before, with Google’s algorithms and manual detection reaching ever more sophisticated levels. In a random sample of 100,000 posts 75% had zero external links. In the second sample of 757,317 well-shared posts 50% still had zero external links. Social shares and links had zero correlation. This is staggering information. An analysis of three-quarters of a million posts, which had been shared prolifically, still had a 50% rate of zero external links. Links don’t just happen – not even to good content worth sharing. Securing worthwhile links takes manual effort. You have to be intelligent in your marketing, and include promotion to those who could possibly link. It’s not enough to blast out promotion – you need to be strategic and intentional in your pursuit of links. Otherwise your pages will never get the links they deserve. They’ll never get the links they need to build audience, establish relationships, and build credibility. That’s why links are such a worthwhile marketing KPI: they’re incredibly hard to fake, and they translate to real marketing value.